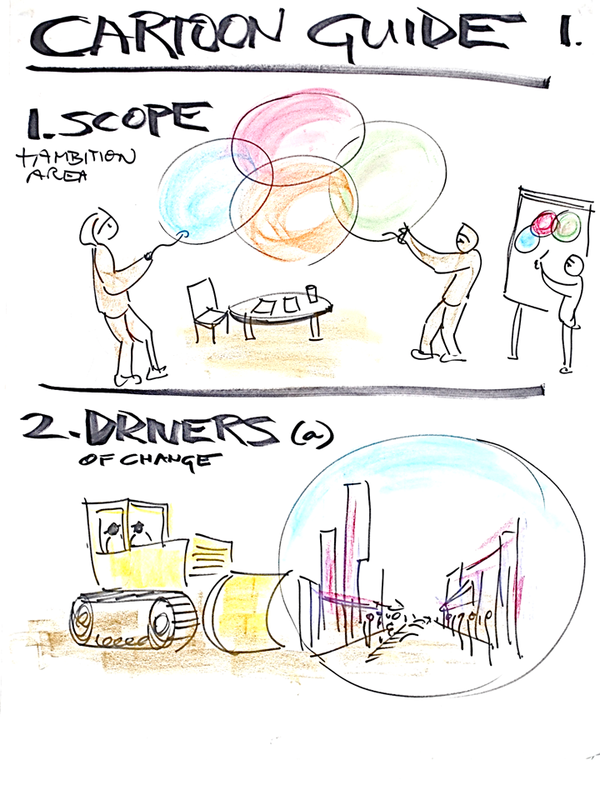 Visual thinking is a powerful catalyst for creative thinking about the future (and the future itself is like a mirror on the present). 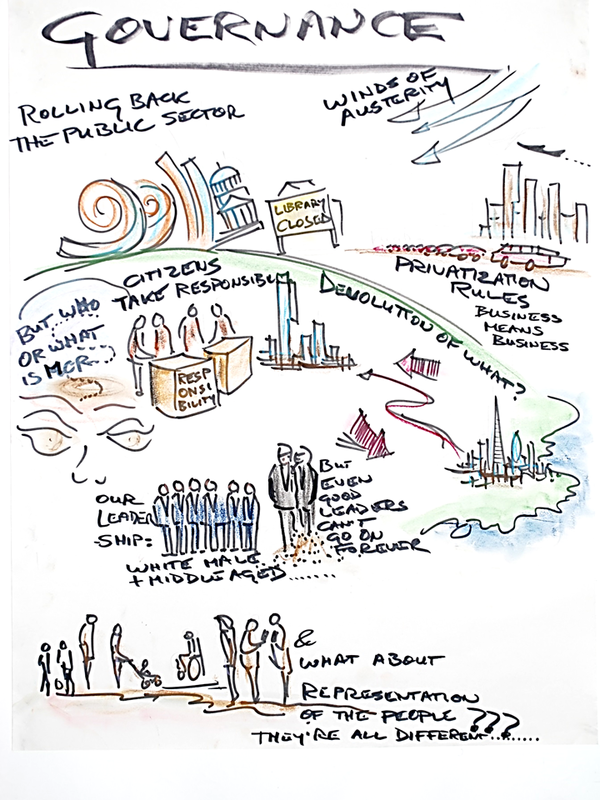 At the GM2040 success scenario workshop, some initial images were produced, to be developed as the project moves forward. Images by Joe Ravetz on Creative Commons license. 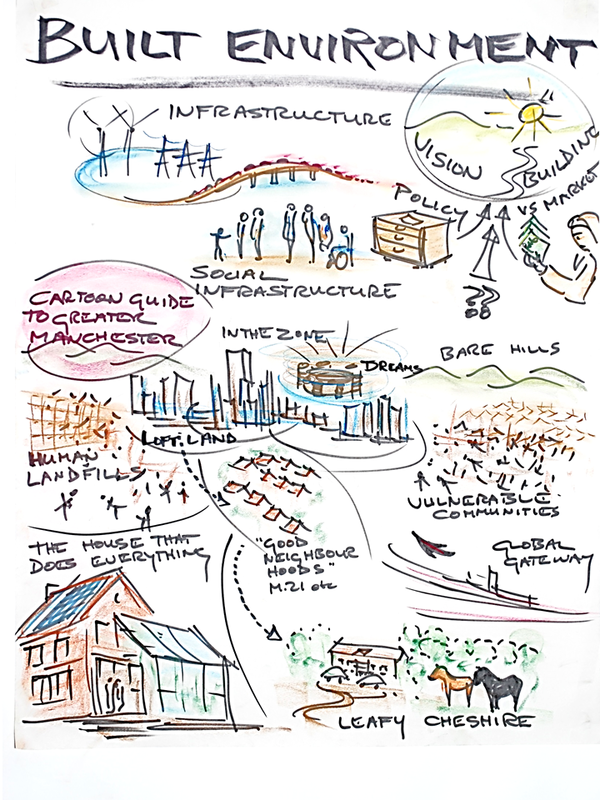 ‘CITY-REGION’ looks at the whole of the GM built environment… from the bright lights to the bare hills, and from the ‘nice neighborhoods’ to the ‘human landfills’…. 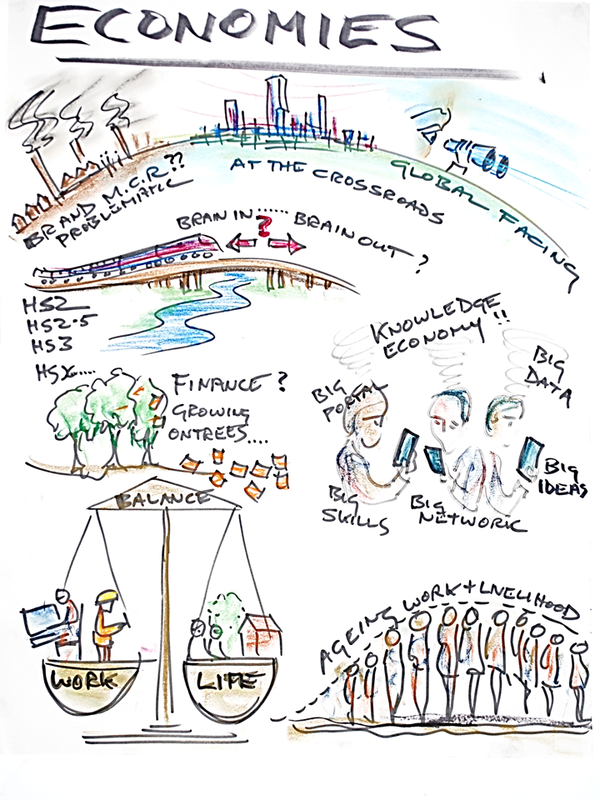 Also there are choices, between physical infrastructure (much in favour) and the social infrastructure: and the overall question of how to achieve the vision – democratic policy or free market enterprise?? 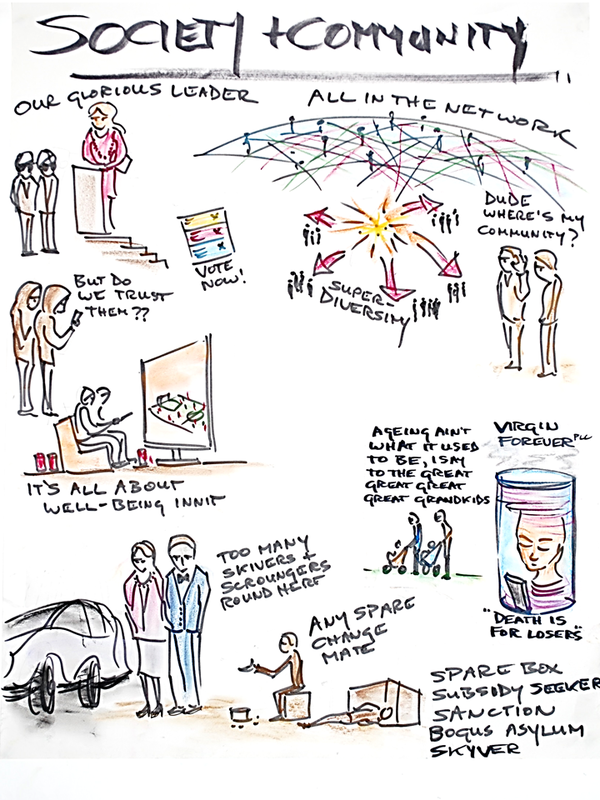 ‘SOCIETY & COMMUNITY’ – is there really such a thing, in an age of mobile, transient, global networks and super-diversity?? Community leadership and trust are vital, as is the question of ‘quality of life’ ?? (for some it’s on the sofa with netflix and a pizza…). Meanwhile it’s clear there are new divisions in society – between ‘nice people’ (coming out of the concert hall) and the skivers / scroungers (lowering the tone and putting off investors). Ageing is also not what it used to be – with an average life expectancy of 150 (within this century), we would see great private sector opportunities coming up. 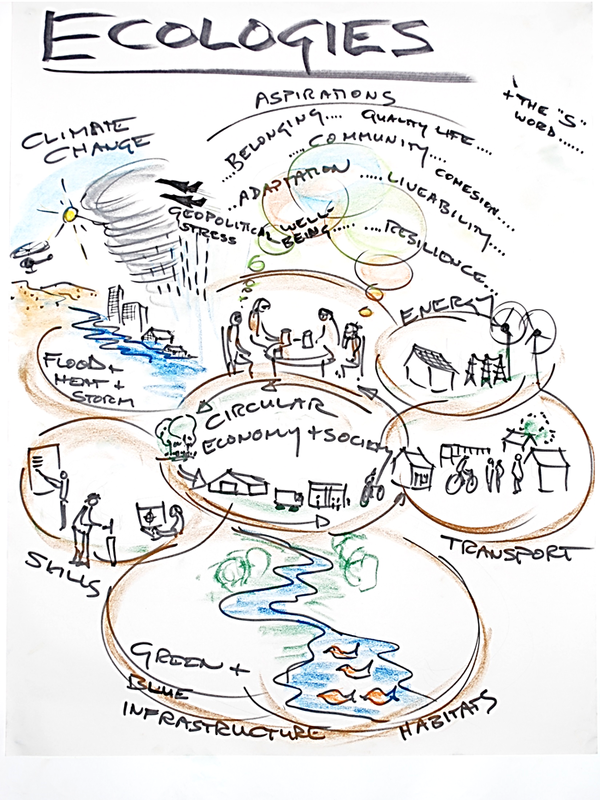 ‘ECOLOGIES’ takes many visionary themes – climate proof cities, circular economy, low carbon transition, green-blue infrastructure etc – and aims to weave them all together (not easy on one page). But how to mobilize in the face of inertia, scepticism and the industrial-financial complex? 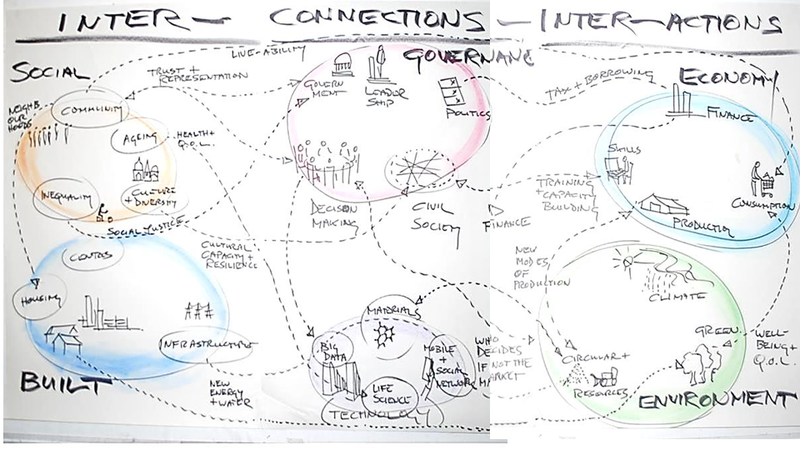 at the top we see a whole set of aspirations, visions, liveabilities, well-being and resilience factors and so on – all fuzzy and inter-connected – but just possibly, powerful forces for change. 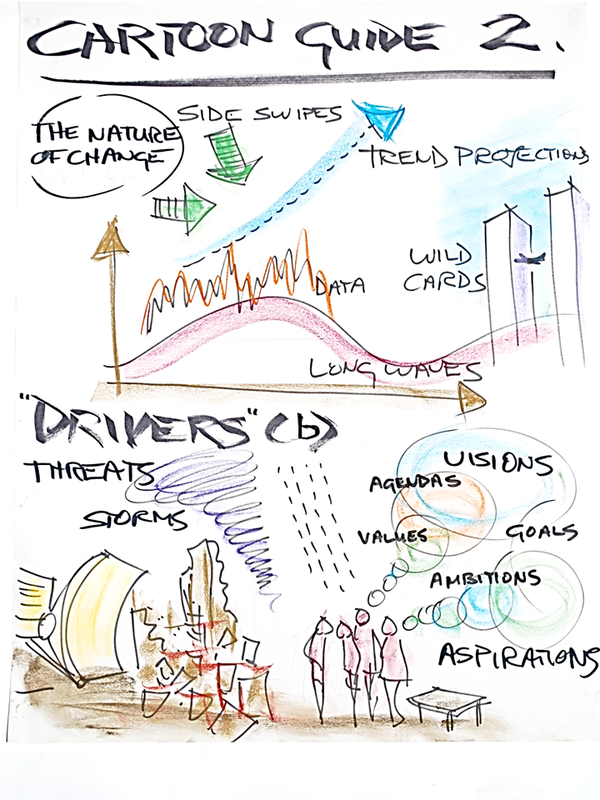 ALSO – DRIVERS OF CHANGE – at the start we threw up a few ideas for a Cartoon Guide to the Future – easy questions like ‘what are we talking about’ – ‘what is change’ – ‘how does change happen’ – ‘ how to track threats and catastrophes and turn them into responses and opportunities and responses’…. etc..